LESSON VIII - DANIEL'S VISION OF THE FOUR BEASTS. - Daniel 7. Lessons From the Book of Daniel LESSON VIII – DANIEL’S VISION OF THE FOUR BEASTS. – Daniel 7. LESSON VIII – DANIEL’S VISION OF THE FOUR BEASTS. – Daniel 7. 1. WHAT experience did Daniel have in the first year of Belshazzar? Verse 1. 3. What came up out of the sea? Verse 3. G. Describe the first beast. Verse 4. 8. Describe the second beast. Verse 5. 11. Describe the fourth beast. Verses 7, 19. 12. What did it represent? Verse 23. 13. What was it to do? Verses 7, 19. 15. How many horns did it have? Verse 7, last part. 17. What was the fate of the beast that had ten horns? Verses 7, 8, 11; Rev. 13: 1 ; 19: 19,20. 19. What kingdom is to follow these earthly kingdoms? Verses 13, 14. 1. “WiNDS” in prophecy are used to symbolize war, strife, and commotion. See Jer. 25: 31-33, where, as the result of a great whirlwind, the slain covered the earth. In Rev. 7:1-3 the angels are commanded to hold the ” winds/’ prevent war and strife, that God’s work may not be hindered. “Sea,” or waters, is used to symbolize nations and peoples. (See Rev. 17: 15; Isa. 8: 7.) This exposition exactly harmonizes with the result described in Dan. 7: 3,—four great beasts came up from the sea; that is, four kingdoms arose as a result of war and strife among the nations. The change described in Dan. 7: 4 evidently represented the change which took place in Babylon after Nebuchadnezzar passed away and the kingdom became weak and degenerate under the rule of Nabonadius and Belshazzar. 5. THE bear raising itself up on one side no doubt symbolizes the greater power and influence of Persia in its relation to Media, with which it was united. One side, Persia, was raised up higher than the other, Media, in the Medo-Persian Kingdom. The three ribs in the mouth of the bear are generally supposed to represent the three countries, Babylon, Lydia, and Egypt, which were conquered by Medo-Persia, the conquering of which further incited it to cruelty and conquest. 7. 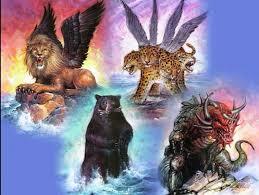 THE fourth beast represents the fourth kingdom upon earth, and this was Rome. It was diverse from all other kingdoms in two important particulars: (1) As a kingdom it changed its religion from paganism to so-called Christianity. (2) It reversed the policy of all pagan nations in regard to the relation of the church to the State. In the pagan- nations the State dominated the church. This is the pagan principle of government. After Borne changed its religion from paganism to papacy, and the papal supremacy was established, the church dominated the State. This is the papal principle of government. 8. THE angel said that “the ten horns out of this kingdom [Rome] are ten kings [or kingdoms] that shall arise.” This has proved exactly true of Rome, and has never been true of any other kingdom. Rome was divided into ten kingdoms between the years 351 and 476 A. D. They have been known in history as the ten kingdoms of Western Europe. 9. THE rest of the beasts, Babylon, Medo-Persia, Grecia, had their dominion or supremacy taken away, but they still continued to exist as nations, that is, their lives were prolonged for a season and a time,—an indefinite period.